UNESCO has officially designated as a World Heritage site the location of the baptism of Jesus Christ on the eastern bank of the Jordan River. Scholars have said it is not known whether the exact location falls on the Jordanian or Israeli side of the river, which has long stirred a tourism dispute between the two countries. The Associated Press reported on Monday that although the U.N. cultural agency declared that most Christian churches believe the Jordanian side to be the location of Jesus' baptism by John, as found in Matthew 3 and other passages, scholars say there is no way to be certain which side of the river was the precise location. Jodi Magness, an archaeologist at the University of North Carolina at Chapel Hill, said that UNESCO's decision "has nothing to do with archaeological reality." "We don't have any sites with evidence or archaeological remains that were continuously venerated from the first century on," he added. Both Israel and Jordan compete for tourism on their side of the Jordan River, and could very well be affected by UNESCO's decision. The Wall Street Journal said in a report last week that Israel and the Palestinian territories have been enjoying strong religion-based tourism in the past few years despite the terror attacks across the Middle East and the surrounding region. Christians make up a significant number of tourists to the country, accounting for 56 percent of all tourism to Israel in 2014. 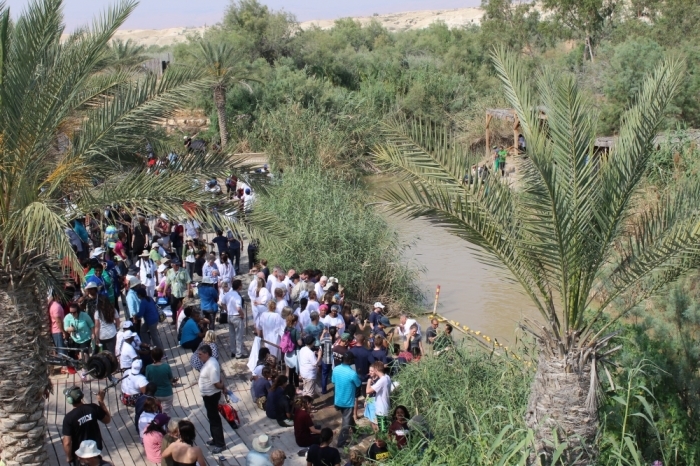 The Israeli site of the baptism draws larger crowds than the Jordanian counterpart, with Israeli officials reporting that half a million tourists visited its site last year, compared to tens of thousands in Jordan. Jordan has also seen tourism numbers in general fall, down to 5.3 million in 2014 compared to 8.1 million in 2010. The decision by UNESCO "drew cheers" from Jordan, AP noted, with Tourism Minister Nayef al-Fayez saying that the kingdom's Hashemite rulers "who are the direct descendants of the Muslim Prophet Muhammad ... are the same ones who are protecting one of the holiest sites of Christianity." Jordanian newspaper Al Rai suggested that UNESCO's decision settled the matter. "Since the site was discovered, Israel has not stopped trying to deal it and attribute it to the occupied side of the Jordan River," the paper wrote. "This despite the religious and historical documents that prove that the baptism of Jesus, peace be unto Him, is on the Jordanian side of the Jordan River." The Jordanian side has received the backing of Roman Catholics, Greek Orthodox and Lutherans, and three popes have visited it since 2000. Some pilgrims, such as 47-year-old Johan Cornelius from South Africa, said that for him, the precise location of the baptism is not as important as recognizing the significance of the event. "It doesn't matter to me much whether it's on this side of the river or the other side of the river," Cornelius said. "The fact that it is the Jordan River and that Jesus has been here, he's been baptized by John in this area, that's of utmost importance to me."